I have three product reviews that I'm going to cover in this post. Because my calorie intake is generally at the lower end, I can also come up slightly low in protein. The RDA for protein is about 50 gr per day; I was regularly getting about 20 - 25 gr per day. So, I was really pleased when I had the chance to try three different products ... all of which I'm going use in the recipes today. These flakes started out as crepes that I left in the dehydrator too long. 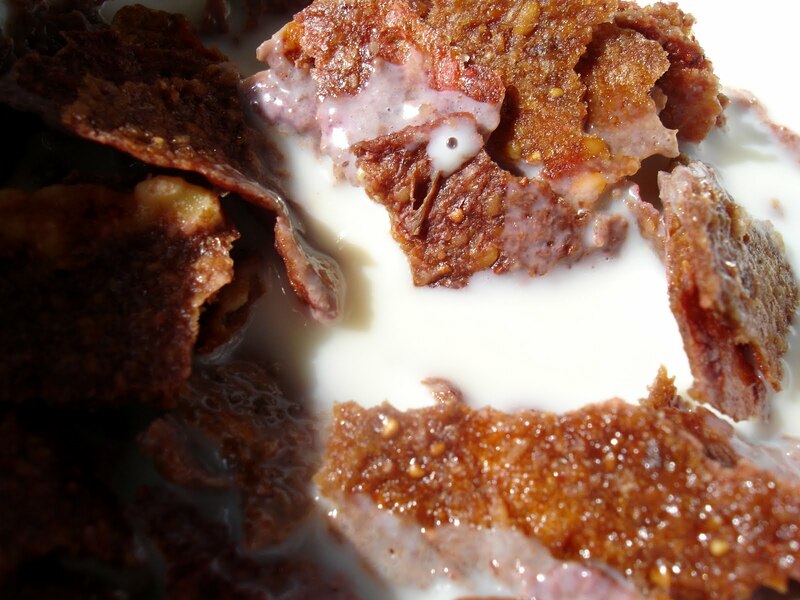 They were pretty crispy and made great "cereal" type flakes. I'm a long time fan of Nutiva, and have used their coconut oil for many years. The Nutiva Hemp Protein Powder has its own light and nutty taste which adds additional flavor dimension to these flakes, and any other recipe. 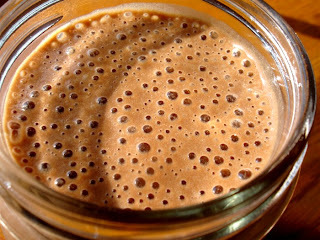 The Nutiva Hemp Protein is just slightly grainy, but that actually worked well here and in some other recipes. The nutritional information for this product comes out to 120 calories per serving, with 11 grams of protein for a cost of about $.60 per serving. I personally like this product so much I now get it in their 3 lb bulk packages ... This works out really well, with very little packaging (excess packaging is one of my pet peeves) and the product is exceptionally fresh. I open the package right away, transfer the powder to quart canning jars and store in the freezer until needed. To make the flakes, in a food processor fitted with an "S" blade, puree all ingredients until smooth. Spread out on dehydrator trays (teflex works best for these) and dehydrate at about 115 degrees for about an hour. Peel from the teflex sheet and flip onto regular dehydrator tray and continue drying for several hours or overnight. Break apart and serve with your favorite nut milk. is made from organic, sprouted brown rice, quinoa, millet, buckwheat, garbano bean and other sprouts, including sunflower seed sprouts. So, the bad news is, I'm allergic to sunflower seeds and couldn't try out the organic raw vegan Raw Protein Powder from Garden of Life. The good news is, my taste testers have informed me this was the "best chocolate shake ever." 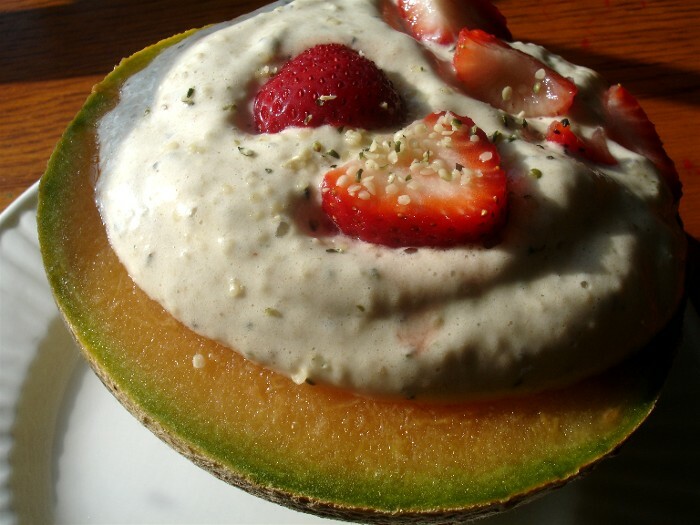 The Raw Protein is very fine and has almost no flavor or grittiness. It mixes into recipes like this one without changing the taste or texture much. 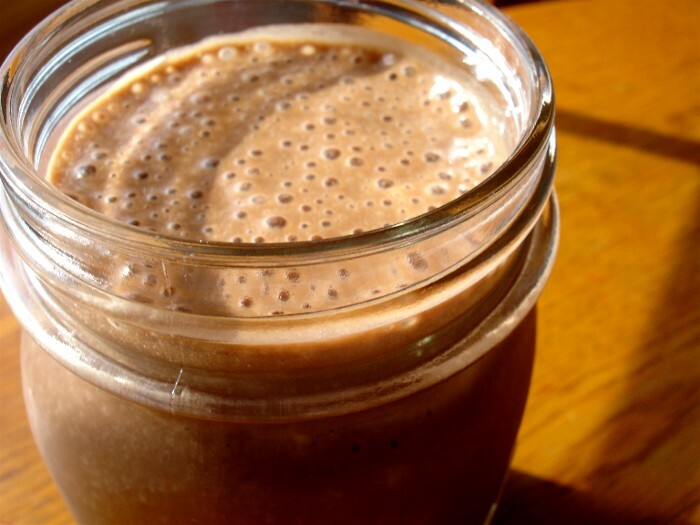 The Raw Protein Powder is about $1.05 per serving which contains 18 gram protein and has 80 calories per serving. 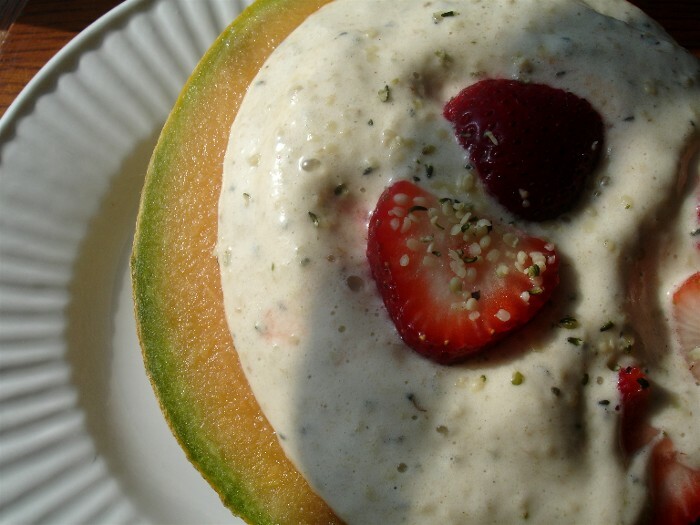 In a blender, puree all ingredients until very smooth and creamy. 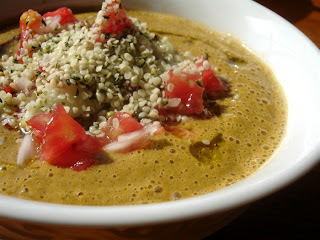 I initially made some tomato soup with the Nutiva Hemp Protein powder. It was pretty good but maybe just slightly gritty and the flavors didn't mesh well, so I made another soup with some hemp seeds on top. The nutty flavor of the seeds goes really well with the creamy tomato soup. 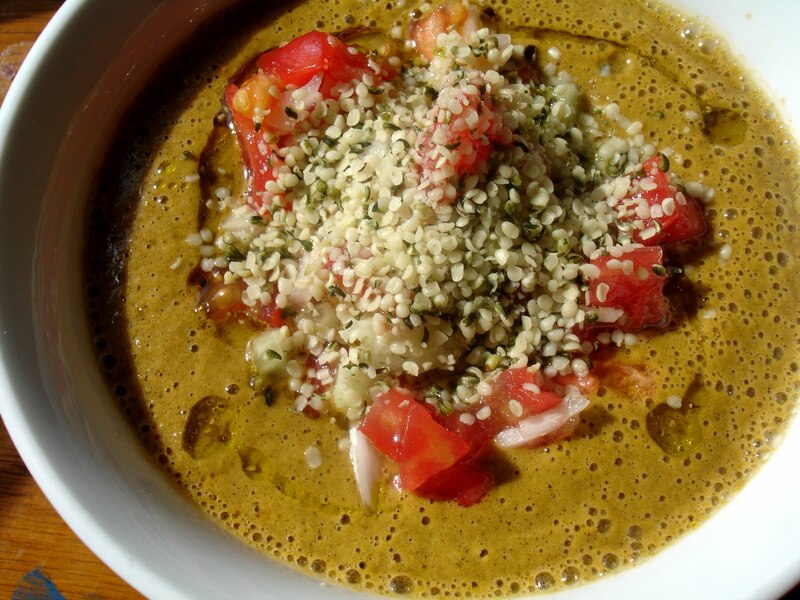 Nutiva's Hemp Seeds are about $1.05 per serving with 11 grams of protein and 110 calories. Set aside one tomato, half the onion, and the hemp seeds. 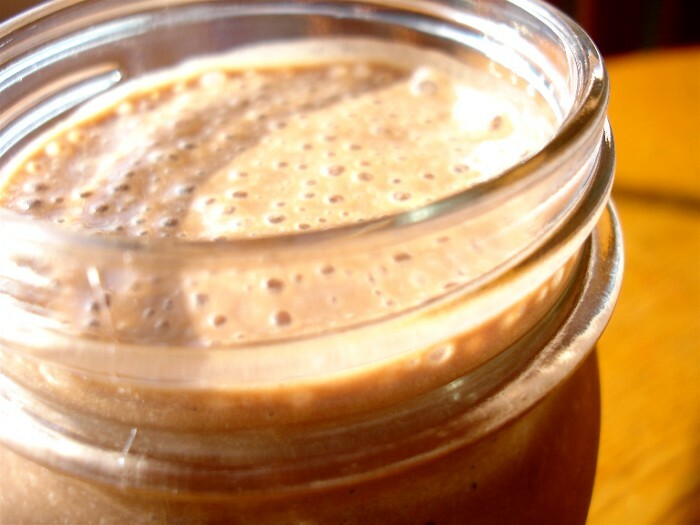 In a blender, puree all the rest of the ingredients until smooth and creamy. 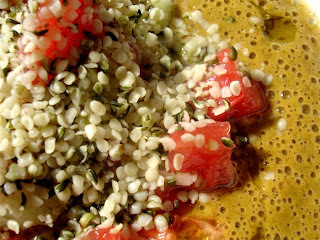 Top with chopped tomatoes, onion, hemp seeds, and a drizzle of flavored oil (see how-to below). To make a flavored oil, simply add the spices of your choice to some olive oil and let sit to absorb the flavors for a few days. I like it pretty intense, so I use about three tablespoons spices per every cup of olive oil, but adjust this to your liking. And experiment ... like most raw food projects, it's almost impossible to really mess this up. Once the flavor has developed to your liking, strain the oil and put in a container and use within two weeks. Open the cantaloupe and gently scrape out the seed cavity. In a food processor fitted with an "S" blade, process the frozen bananas and vanilla until smooth. If you like the hemp seeds more processed, add them now. I waited and added them once the bananas were almost smooth. The mix will be like soft serve ice cream and can be divided between the cantaloupe halves and topped with sliced strawberries. Question of the week ... Do you have any serious food allergies and, if so, how do you handle them? Once again I am amazed. Thank you for sharing your gift. We have many food intolerance issues in this house. One child with IBD of some sort that we put on wheat free and dairy free and a high raw diet. Two other family members with Crohn's Disease. They are eating a high raw diet and also no dairy or wheat. . yummy!!! chocolate shake for lunch! will definitely be trying the melon with cream!!! Those flakes look great and I couldn't pass on the choccie shake..love those things! It's so fun using jars...don't ya think! Enjoy! very high protein day. perfect for telling people how to get their protein on a raw diet. yes i have serious allergies, i can't eat gluten. i make most of my own food but i do worry about cross-contamination from bulk bins, restaurants, etc. my husband doesn't eat gluten at home either, which helps. 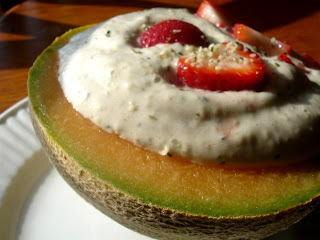 All of these recipes look awesome, especially the dessert melon! I have gluten and milk intolerances and I am having difficulty with soy lately as well. The intolerances are relatively new and have been difficult to get used to but It has forced me to be creative in the kitchen and has really sparked my love for cooking. I am experimenting with new foods and alternative grains and I love it. I've found it's best to focus on the delicious things I can eat and not the things that I can't eat anymore. I really enjoy your blog, thanks for posting so many really good looking recipes. I linked your page to my blog: Kelly-izzo.blogspot.com. I love your blog. Your recipes are awesome. My children both have food allergies -- and it amazes me that they do given how health conscious I was during their pregnancies and the lack of allergies in our families. My daughter, Cora, was allergic to just about everything. Thankfully she outgrew almost everything (still seems sensitive to dairy). My son Tobin is allergic to soy, dairy, eggs, garlic and CORN! The corn is by far the most difficult since it is in everything. He is still nursing so I have to avoid his allergic foods as well. Thanks for all of the recipes! 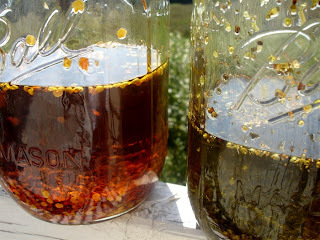 Oh wow, thanks for the recipes and espceially the tip about making flavored oil! I never thought about doing that. Your tomato soup looks amazing too. Shall try scattering hemp seeds on top of it. 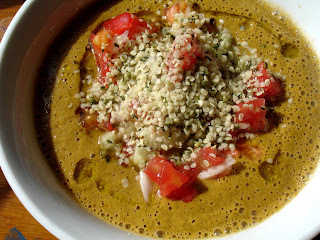 I made a hemp seed sauce once, but it was so gritty I felt like dying while eating it. Haha. Seriously, thank you for your divine recipes! 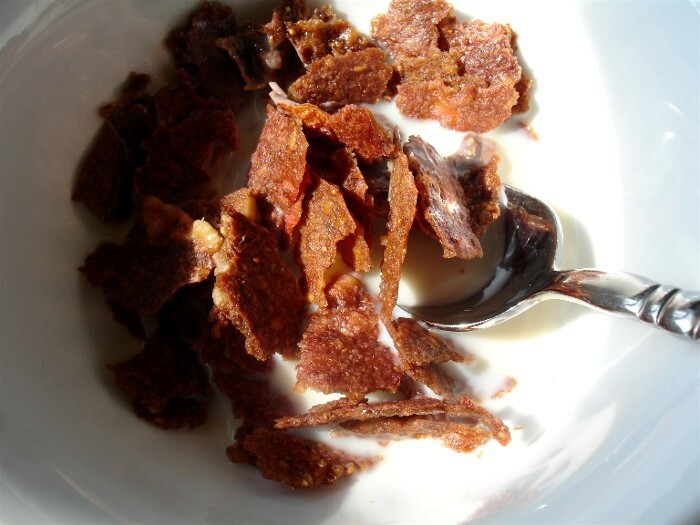 Love the idea for protein flakes. I might be able to get my hubby to try that one. He is addicted to the protein cereals sold in the store. This is much better. i gotta say i do love the hemp seeds. 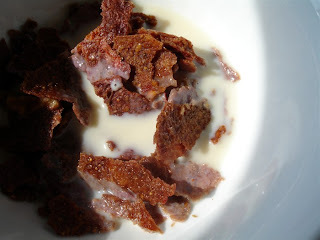 love the protein flakes - so simple! ""best chocolate shake ever." 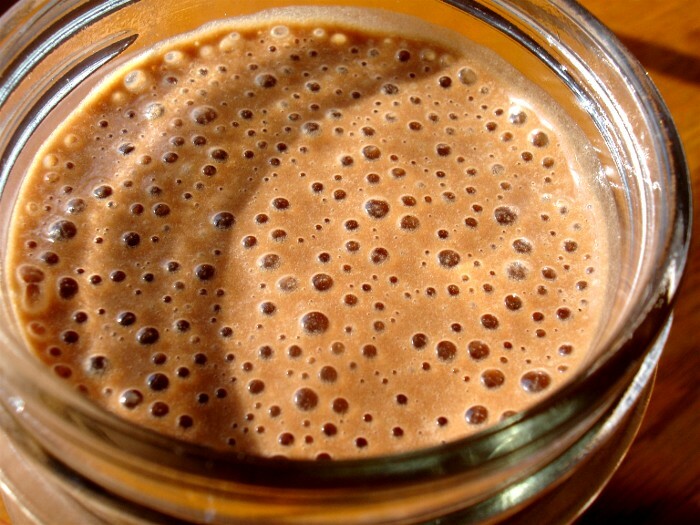 The Raw Protein is very fine and has almost no flavor or grittiness. It mixes into recipes like this one without changing the taste or texture much." ---THAT is such great info...thank you! I have seen this one on other raw blogs but i just loathe spending money on prot powders b/c 1. i find them very hard on m gut no matter what high end vegan powder I buy but 2. they mess up the taste of food and it tastes either fake or "dirty". Earthy some would say, i would say gritty dirty LOL. And your prot flakes. Wow. You are a genius. and the oil..impossible to mess up...that's what i always tell ppl with raw cooking projects too! you inspire me with every single post!